The Quaker Tapestry is a series of over seventy embroidered panels illustrating the history and experiences of Friends. It sprang from an idea in a children’s class in a Somerset meeting in 1981, and has been made by many hands in many meetings. It is a new way of sharing Quaker insights through exhibitions in Britain, Ireland and other countries. It is now on permanent exhibition at Kendal Meeting House. 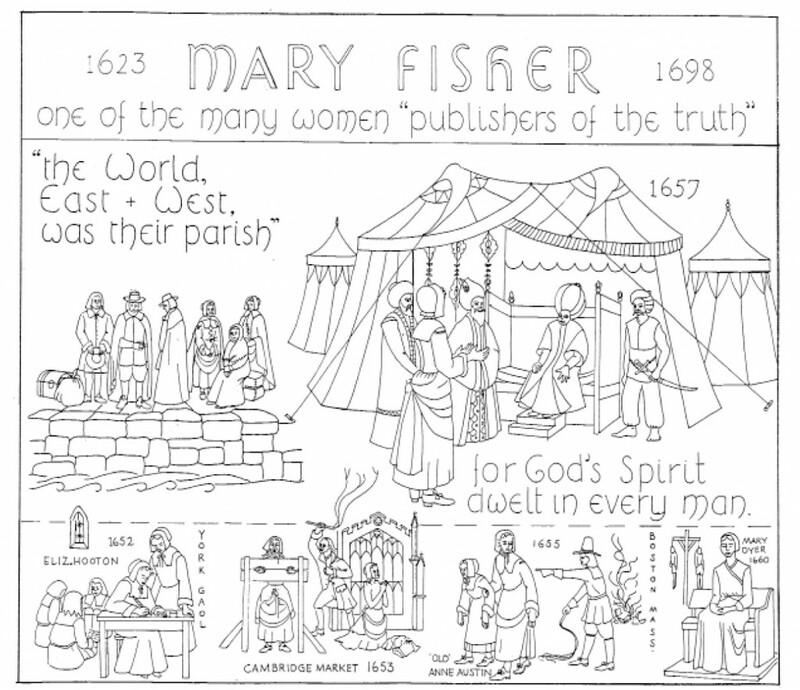 The following line drawing is a reproduction of one of the cartoons used to plan the tapestry panels. Our book of discipline tells how Friends try to live by the leadings disclosed in worship and prayer. The early Friends believed that they had rediscovered true Christianity and that they had a duty to tell the world. They travelled widely, ‘publishing the truth’, first throughout Britain and then overseas, even approaching the sultan of Turkey. Now, however, most of the journeys from Britain Yearly Meeting are to do service work: teaching, reconciling, helping with development. There are many small groups of Friends who owe their origin to the spirit reflected in those doing such work, who ‘let their lives speak’. Evangelical meetings in some parts of the world lay great emphasis on missionary work, as British and Irish Friends did in the past, and as a result there are many thousands of Friends of the programmed tradition in countries such as Kenya and Bolivia. It is part of our service to try to communicate the faith that we have tested in experience. We long to reach out to those who may find a spiritual home in the Society; we do not claim that ours is the only true way, yet we have a perception of truth that is relevant to all if, as we believe, the light to which we witness is a universal light. Each meeting must find its own way of sharing the Quaker experience, each Friend remember ‘that we are each the epistle of Yearly Meeting’.